Our Ambrozyme Syrup is used as general digestive tonic for all age group patients. Ambrozyme Syrup, provide by us, is formulated by fungal diastase and pepsin in accurate 2:1 ratio. Ambrozyme Syrup, we offer, has a pleasant taste ad is completely safe for diabetic patients. We provide Ambrozyme Syrup in 200 ml pet bottle. 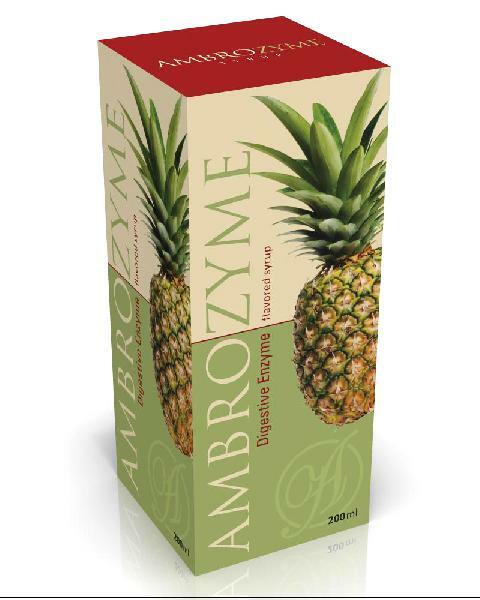 Ambrozyme Syrup, provided by us, is used for dyspepsia, digestion and allied digestive disturbances. Ambrozyme Syrup has medically proven Proteolytic and Amylolytic enzyme that is required for appetite and instant digestion. Flavored Syrup Base - q.s.